Effective April 23, 2018, IBM will withdraw from marketing the following products. On or after the effective date of withdrawal, you can no longer order these products directly from IBM. As we understand it, this relates to a lawsuit between Sony Corporation and FujiFilm. If you're using LTO-8 Tape Media, we urge you to buy additional quantities right now to see you through the next two quarters at least as very limited quantities are available. 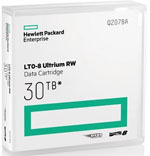 We currently have stock of IBM LTO-8, HP LTO-8 and Quantum LTO-8 Ultrium Tape Cartridges, while stocks last.